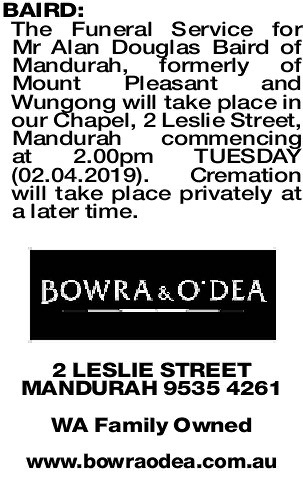 The Funeral Service for Mr Alan Douglas Baird of Mandurah, formerly of Mount Pleasant and Wungong will take place in our Chapel, 2 Leslie Street, Mandurah commencing at 2.00pm TUESDAY (02.04.2019). Cremation will take place privately at a later time. 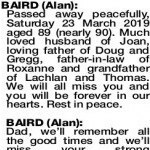 BAIRD ALAN Passed away peacefully, Saturday 23 March 2019 aged 89 (nearly 90). 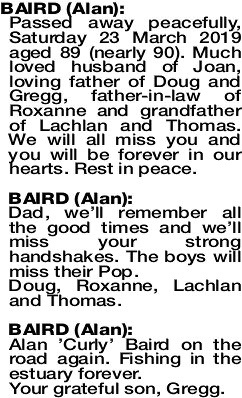 Much loved husband of Joan, loving father of Doug and Gregg, father-in-law of Roxanne and grandfather of Lachlan and Thomas. We will all miss you and you will be forever in our hearts. Rest in peace. Dad, we'll remember all the good times and we'll miss your strong handshakes. The boys will miss their Pop. Doug, Roxanne, Lachlan and Thomas. 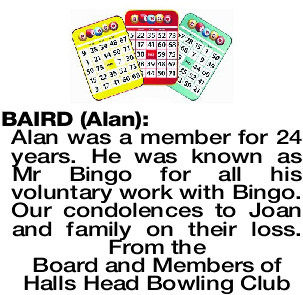 Alan 'Curly' Baird on the road again. Fishing in the estuary forever. Dear Joan and family, my heart goes out to you. I know how much you loved Alan. Your very old friend, Beryl.